Description: A northbound CSX pig train is about to cross the NS diamond as the day closes on a great day of railfanning. Description: A CSX double stack passes the passenger station in downtown Birmingham as a southbound NS slows to a stop at the crossing. 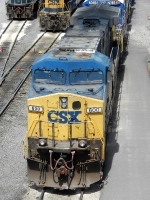 Description: The first AC60CW for CSX sits in the afternoon sun. Now rated as an AC44CW the unit still is in it's special YN2 paint. Description: CSX 600 looking worse for wear at west end of Dewitt yard. 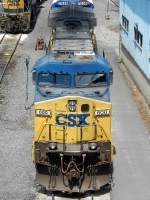 Title: CSX 600 at west end of Dewitt yard. Description: The AC60CW that isn't. This was one of three pre-production models on CSX and the original prime-mover has been replaced with the 4400 HP 7FDL16 engine. It still has kept its AC60CW dual-lightning bolt paint, even though it's looking rough at this point. Description: Q351 is next west through 175 at 1517. Description: Built December 1979 as Conrail 1669. Description: Empty hoppers approach Shen at 0952. Description: UP’s AWFBVR-06 (Auto Empties Westfield, TX-Brownsville, TX Reposition). Description: UP trains, ILBEW-04 and the AWFBVR-06 sit beside each other. Description: CSX C40-8W 7859 leads a GE/EMD/GE/EMD quartet through Union City, GA on October 18, 2016. Description: CSX SD60 8718, AC44CW 600, and SD50-2 8511 run two, three, and four through Union City, GA on October 18, 2016. Description: Leading a GE/EMD/GE/EMD quartet, CSX C40-8W 7859 approaches the Jonesboro Rd gates in Union City, GA on October 18, 2016. Description: Leading a GE/EMD/GE/EMD quartet, CSX C40-8W 7859 hustles through the Jonesboro Rd gates in Union City, GA on October 18, 2016. Title: CSX 600 on limestone train at Westcott Blvd. Description: 471 powers west at 0642.